BRIGHT GmbH & Co. KG. Established in 2005, BRIGHT is Europe’s leading tradeshow for street- and urbanwear, skateboarding and related boardsports. As an established platform that above all has its amazing vibes to thank for its popularity. 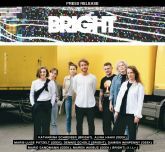 An original platform known for its sharp community, BRIGHT presents today’s leading brands, showcases the latest developments and lifestyle trends, and boasts a stunning selection of additional events all over Berlin that range from skateboarding to art and music. BRIGHT is a format of PREMIUM GROUP.